Construction of the battle exploit memorials was a major undertaking for the New Zealand government and relied on the successful collaboration between Seager and numerous international parties. While few images of the battlefield memorials in Europe survive in Seager's lantern slides, the photographs he took at Gallipoli offer us insights into the extensive work that was done to construct the cemeteries and memorials over six years. After the Armistice, the immediate task of the War Graves Registration Unit at Gallipoli involved the exhumation and identification of human remains before a more organised reinterment could take place. When the Imperial War Graves Commission took over this work in 1920, new roads were made, the permanent cemeteries were established, and the extensive landscaping work commenced. 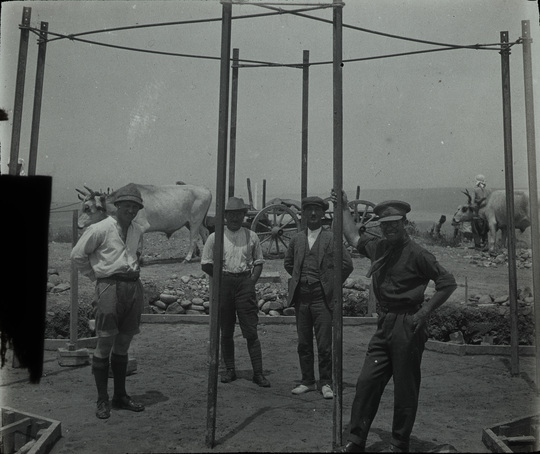 Contractors stand on the completed foundations of the monument on Chunuk Bair. The workers who repaired and constructed the new roads, cemeteries and memorials on Gallipoli were a mixture of local labourers and refugees. Employed by Sir John Payne Gallwey, Ltd., and supervised by IWGC staff, more than 250 Greeks, Armenians, Russians, and local Turkish formed the main gang of workers, and were supplemented by Italian masons for particular projects, such as the Chunuk Bair battlefield memorial. A workers’ quarters was established at Kelia Bay, where the IWGC settlement was also located. Seager also consulted horticultural expert R. Kett of Kew Gardens, who had been advising the Commission on plantings for the cemeteries since 1923. He experimented with New Zealand and Australian plants in nurseries at Kelia Bay, the Anzac sector and Helles to determine which species would thrive in the warm climate. Unfortunately, the harsh conditions caused these plants to fail repeatedly. Sir James Allen (right) with General Sir Alexander Godley on the path to the battlefield memorial at Messines. Sir James Allen (1855–1942) was a key figure behind the construction of New Zealand’s battlefield memorials. Prior to the war, he had represented Otago electorates in Parliament and became minister of defence and finance in 1912, holding the former portfolio throughout the war. Allen oversaw war pensions and rehabilitation of returned soldiers after the war. In 1920, he took up responsibilities as New Zealand’s high commissioner in the United Kingdom and was its representative at the League of Nations. He took an active interest in discussions about the design of war memorials in New Zealand. He had lost a son, John, at Gallipoli in 1915, and pushed for the construction of non-utilitarian war memorials at New Zealand’s first town-planning conference in 1919 (organised by Seager). 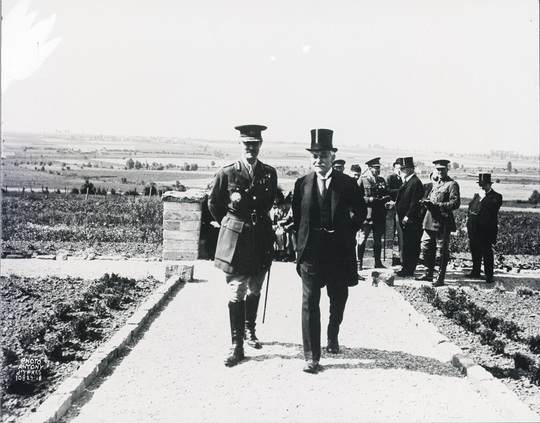 As high commissioner, Allen played an important role in empowering Seager to supervise the disparate sites, arranging for him to tour the battlefields as well as tackling bureaucratic challenges through diplomatic channels. His work in negotiating to secure the sites for the memorials was particularly indispensable to Seager’s vision for the memorials. Lieut.-Colonel Cyril Emerson Hughes (1889–1958) was a civil engineer and surveyor from Launceston, Tasmania. He served as a lieutenant in the Australian 26th Battalion at Gallipoli. After the war, with the rank of Temporary Captain, Hughes led the War Graves Registration Unit at Gallipoli in its task to locate and identify remains, before consolidating burials in preparation for the building of the cemeteries. This was part of the first landing of the British at Gallipoli since the Armistice, and Hughes, now promoted to Lieutenant-Colonel, was appointed Inspector of Works and Supervising Engineer. In October 1920, the IWGC took over from the Unit and Hughes was retained as the Commission’s director at Gallipoli. By 1925, Hughes had become Deputy Director of Works for the IWGC at Gallipoli and he eventually became the Commission’s chief officer in the Middle East. He was awarded an M.B.E. and a C.B.E. 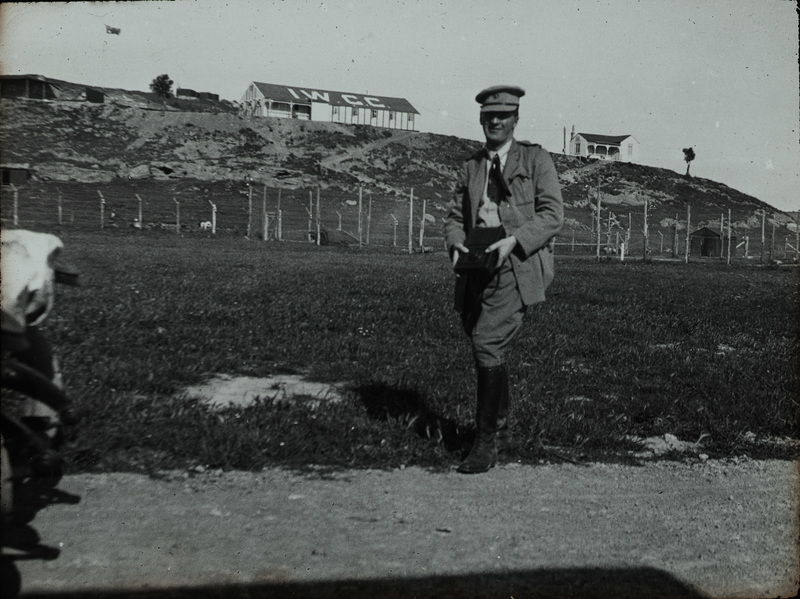 Lt. Col. Thomas Nangle photographed at the Imperial War Graves Commission headquarters at Kelia Bay, Gallipoli, 1921. During Seager’s visit to Gallipoli in 1921, he met Lieutenant-Colonel (Padre) Thomas Nangle (1889–1972) of Canada, who represented Newfoundland in the IWGC. Nangle had enlisted in the Newfoundland Regiment in 1916 and became chaplain to the First Battalion. After the war, as Director of War Graves, Registration, Enquiries and Memorials, Nangle personally supervised the exhumation and identification of Newfoundlanders’ remains during the re-internment and building of permanent cemeteries. He oversaw construction of 15 Canadian war cemeteries in Europe and Gallipoli, and he put forward the idea to establish a ‘Trail of the Caribou’, which features five bronze caribou sculptures as memorials to the Newfoundland war effort in France and Belgium. Seager’s photograph of Nangle shows him with the camera he was using to take “cinematograph views of the different portions of the battlefield” on Gallipoli. In the background is the IWGC camp in Kelia Bay, with the workshop behind barb-wired fences. One of the houses the officers lived in is also visible on the right of the hill. Seager later wrote that he and Nangle both agreed that a single monument at Cape Helles marking the combined efforts of the British Forces on Gallipoli would be more appropriate than many different memorials scattered over the various battlefields.